Why you laugh? 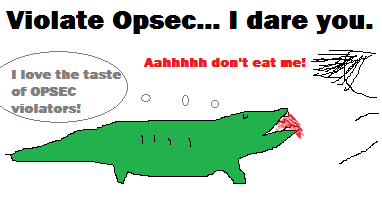 OPSEC IMPORTANT! I've read it, don't agree with all of it, but will respect it! Now I'm confused. Is my countdown fine because it clearly states it's not deployment related? I mean, he's a troop moving, but it's not troop movement. I really should know this by now. Since yours are not deployment related, and you made that clear, you are fine. However just to cover my bases (NOT saying you are doing this), if anyone does the above to count down for a deployment and we find out, it will carry a heavy consequence. Noted. You mean if someone pretends its not deployment related but it really is? That would be gross. BiggyBiggs...the Wifey that makes me go "WoW"